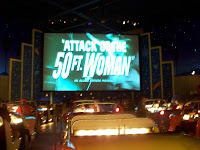 A few weeks ago I talked about the sense of humor needed to dine inside 50’s Prime Time Café and Sci-Fi Dine-In Theater. Little did I know then that I was about to become my own guinea pig. 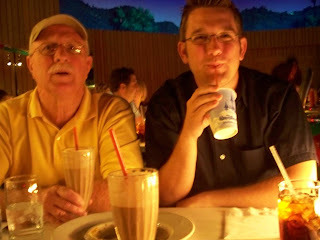 On our last trip my dad, Aunt Suzie, Uncle Gene, and myself decided to grab a late lunch at Sci-Fi. We sat at a table, or car if you are so inclined, near the back with a full view of the entire “audience.” I wasn’t feeling so great, I usually feel a little under the weather my second or third day into a trip as my body adjusts to the sudden hot and air conditioned environmental changes it is constantly going through, but was carrying on like a trooper. I order a Cherry Coke, because I cannot resist real Cherry Coke. Sure, I can drink it out of a bottle, or can, or even if it is Coke’s Cherry Coke from a fountain, but there is something about Coke with real fake cherry syrup added to it that gives it the perfect taste. It is a simple pleasure, but a pleasure to be sure. The drinks arrived and I reached over for my drink, my hand slipped on the outside and, being under the weather with reflexes that were slower than dirt, I knocked the entire glass straight into my Aunt’s lap. Her reflexes were much better thank mine and it only caught her pants as she jumped up, pants which were, by the way, white. The heavy napkins we had, that the family next to us offered, and the stack that the waitress brought helped soak up all of the soda off of the table and floor while I felt utterly miserable, and not because of my cold-like symptoms. Comments were made by our waitress about how I, the driver, had had too much to drink, but that she would bring me another drink anyway. And so she did, a child’s cup, with a straw. Oh, and it had a lid too. My aunt’s fast thinking got a majority of the soda out of her pants, and left her freezing cold and wet, I was able to enjoy my Cherry Coke in little sips, and I definitely had to laugh at myself all through lunch. Of course that was mostly because even had I wanted to let it go, the waitress wouldn’t have let me forget, and that is just the way it should be. I couldn’t have asked for a better example to prove how much fun you can have at these restaurants if you are just willing to let go and not take yourself so seriously!